360◦ Feedback is a process that provides employees with an opportunity to receive performance feedback from co-workers. Often it is completed in conjunction with your performance management system. Getting candid feedback on specific performance criteria can be an important part of any leader’s growth. Often times what is uncovered is “What they don’t know, they don’t know” or their professional blind spots. Having five or more people offering feedback helps to ensure that a balanced picture is presented to the leader. Implemented properly, 360◦ Feedback can be a really valuable tool and process. Implemented poorly, it can leave all involved soured on the experience. At DillonMarcus, we offer two approaches – each with their unique set of benefits. One is conducted in real-time, in a live group setting. The other works well when respondents are geographically dispersed. This approach is perfect for a Senior Team or a work group that is looking to build trust and enhance their performance. In essence, one individual on the team interviews other members of the team about one of their teammates. The questions being asked are agreed to in advance – with the feedback recipient being able to select at least one of the questions being asked about them. After the interviewing process is completed, the data is aggregated by the interviewer into a handwritten report by common themes – no names are included in this report. Next the interviewer gives the feedback to the recipient in a small intimate setting of three people. 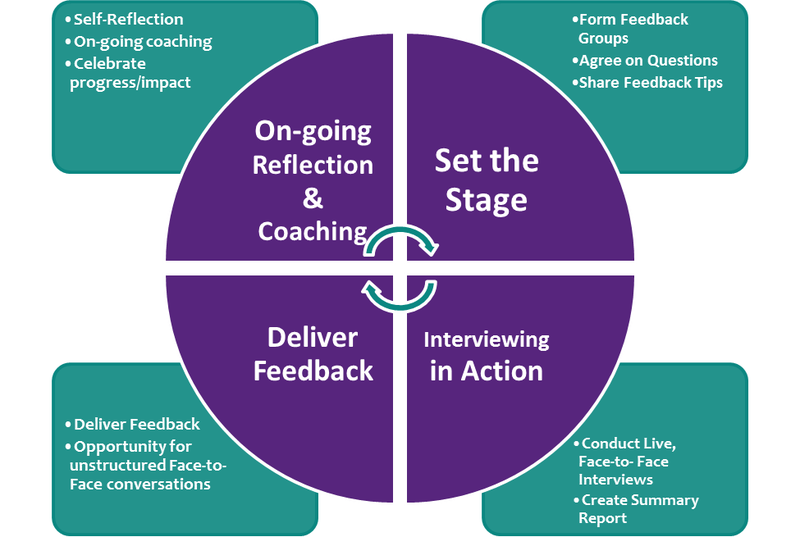 The feedback process is balanced, because each person in the group of three will be hearing feedback about the other two people in their group. Everyone is on a level playing field because everyone is giving and receiving feedback. What’s beneficial to this approach is that it builds essential leadership skills of those involved – seeing the strengths in others, giving thoughtful feedback supported by examples, growing their emotional intelligence (EQ), etc. It also builds relationships among team members as the process is very personal. Team members will frequently support each other after participating in this shared experienced. This option doesn’t require a lot of explanation as it follows the traditional 360◦ model. What’s critical to the success of this approach are the questions that are selected and the context that is built around the process. Both have significant impact on outcomes. We like the 360◦ provider Echospan (www.echospan.com). They are affordable and their system has tiers of customization depending upon how specialized you’d like to get. We recommend individual performance coaching as a follow-on to both approaches. Typically we suggest a 3-6 month time-period of coaching so the individual has time to integrate the data and improve their performance with the help of a dedicated, neutral professional.